Familiarise yourself with the contents of this website. 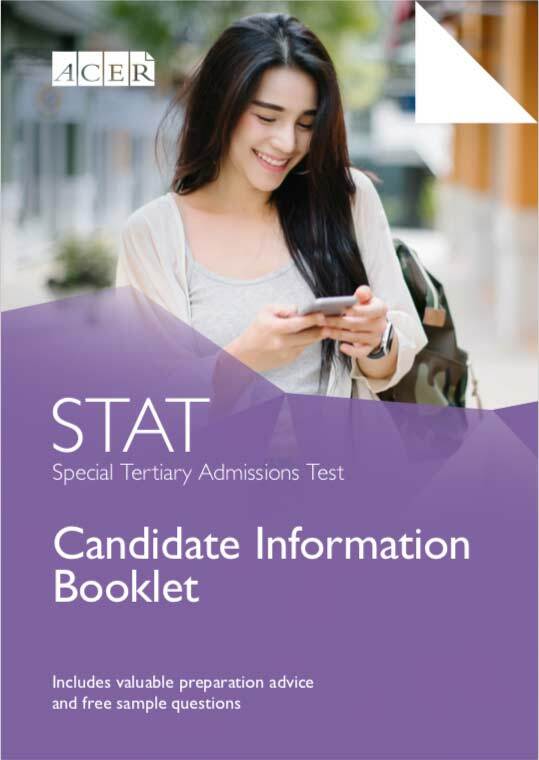 Read the preliminary information in the free STAT Candidate Information Booklet. Work through the free practice questions provided in the STAT Candidate Information Booklet. Work through the additional STAT Practice Tests if you feel you require the extra practice with these types of questions. Some institutions offer STAT workshops to assist candidates to prepare for an exam situation. ACER is not affiliated with such workshops/preparation courses and does not endorse them. ACER does not provide past papers to any of the STAT workshops. The only sources of past STAT questions are the STAT Candidate Information Booklet and the STAT Practice Tests, published by ACER. ACER does not run any workshops and cannot provide any recommendations. Coaching for tests such as STAT is not particularly effective in improving candidates' scores. This is partly because the test is designed to assess reasoning and comprehension skills which develop over extended periods of time through a variety of experiences. ACER cannot provide any recommendations for tutors.